Whatever the special occasion let us help you celebrate because we love parties. We have three beautiful rooms with abundant natural light, that can be reserved individually or in combination, for parties from 15 to 100. 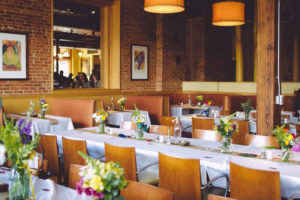 Whether it is a business gathering, a festive cocktail party, a reception, baby or bridal shower, or a fun get-together with your friends, we can offer a space and menu selections that all will love. Our attentive staff is the icing on the cake. They will make sure wants and needs are met and everything goes as planned. Our menus offer seasonal, fresh local ingredients that rotate regularly for the highest quality. We have an on-site bakery where we bake fresh bread, desserts, cakes, cupcakes, cookies and morning baked goods each day. Extra touches will set your event or celebration apart. 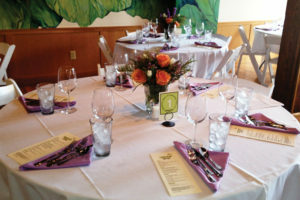 We offer special packages including linens, fresh flowers, balloons, host gifts and more. Our event planners will help make your event exceptional. Ready to Book A Private Party? Determine the date and time of your event and a general number of guests. What kind of food would you like to offer your guests? Breakfast, lunch, dinner, cocktails, dessert buffet? Not sure? 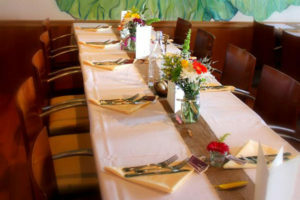 Take a look at our Private Party Menus to get some ideas. Together we will determine the choices for your guests based on the type of event you’re planning and your budget. Please fill out our party inquiry form below to get things rolling. 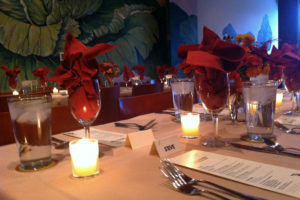 Please download our private parties menus, contract, and details here. Please fill out and submit this form, one of our event coordinators will be in touch within one business day. How would you preferred to be contacted? Please tell us anything that will help us plan the best event for you. Thank you for inquiring and considering Food Dance for your event!